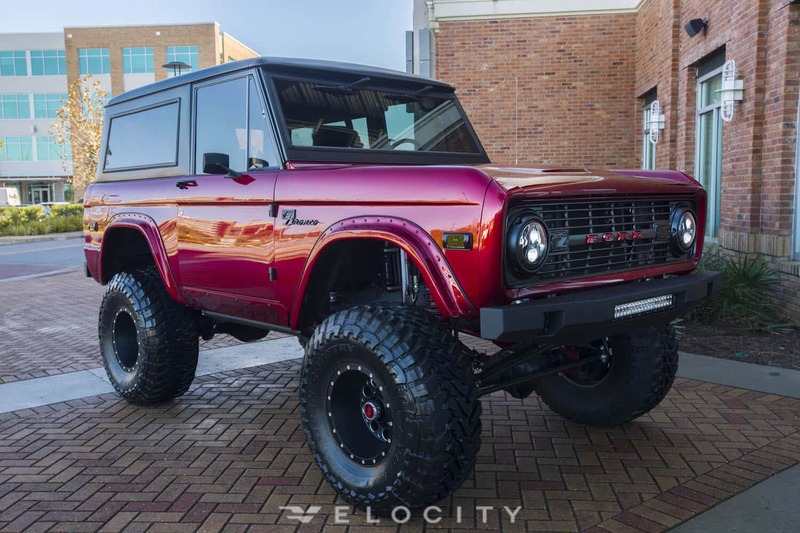 Velocity Restorations out of Pensacola, Florida, specializes in early-model Ford Bronco restorations. That’s where Kandy comes from, having spent months being stripped down, repaired, reinforced, re-assembled and dressed up. The restoration professionals left no aspect of this beauty go neglected. Most of all it’s important to note that Velocity Restorations performed all the work absolutely in-house. Fabrication, upholstery, welding, bodywork, electrical, paint, wheels, suspension, powertrain – it didn’t leave the shop for anything. What’s so special about kandy? At its heart, this 1976 Ford Bronco holds a brand new Coyote 5.0-liter crate engine, spinning up 345 horsepower. A 4R70W transmission and 2-speed Atlas transfer case are mated to it, rounding out a bullet-proof powertrain. Seems like this is more than a slight improvement from the stock 302 V8 engine putting out a “whopping” 190 horsepower. If you’ve got a thing for off-roading, Kandy can hang. Lifted 5.5 inches, supported by Fox coilovers, and resting on a redone steering and suspension system with extended radius arms, Kandy isn’t just eye-candy – she’s extremely capable. Then there’s the wheels. Toyo Open Country M/T 35-inch tires on gorgeous black wheels. In the front, the red manual locking hubs have been painted red. These little extra details are what Velocity Restorations is known for. This Kandy Red paint job is the visible completion of the project, but what’s underneath is important too. The 1976 Ford Bronco was a complete frame-off restoration, and everything received the same attention to detail. A matte-black grille, hardtop, and blacked-out side mirrors and marker lights add to the attitude. An LED light bar is inset into the front bumper, as are LED fog lights. The round headlights aren’t your typical sealed-beam assembly, they’re also LED for both high- and low-beam operation. Notice those fender flare rivets? Each one is meticulously spaced because, well, why would you skimp on accuracy once you’re in this deep? But because it’s a resto-mod, some things won’t change. Those exposed door hinges, the classic “Bronco” badging on the sides, and the push-button mechanical door handles had to stay. Inside the 1976 Ford Bronco resto-mod, you’ll find a rugged, subtle interior finished extremely well. There’s a custom 6-point roll cage tucked away rather neatly and finished in matching matte-black paint. Front bucket seats and the rear bench are re-upholstered in custom black covers. Even the door panels remain old-school, down to the manual window cranks. The 1976 Ford Bronco Kandy can do it all. It’s a rock-crawler, a beast on the dunes, and a rocket on the highway. And it’s one-of-a-kind – you won’t find another one like it anywhere in the world. And best of all, it can be yours. It’s not cheap, but money usually isn’t an object when you’re indulging in a classic vehicle restoration. Not quite your taste? Velocity Restorations has more. There’s a few other Broncos for sale, as well as the occasional classic car or vintage truck. They are great to drool over even if you’re just window shopping.